I realize that this blog is almost 99% me taking pictures of my fingers and posting it on the internet, but I am actually more than just my fingernails. I have hair, too. And not’s not good hair, either. It’s temperamental, board-straight, thin, fine, color-treated hair. And I'm sure many of you are in the same boat as me, so when I got the opportunity to try one of Dove’s new conditioners, I happily took it. Hair conditioner is always one of those things of which I am trying to find my perfect match. Many don’t condition enough and leave me with a matted, tangled mess to brush out; or on the flip side, they are too heavy and weigh down my fine hair, so I look greasy by the end of the day. Thus, even the though the bottle said all the right things, I approached this Dove review with a fair amount of skepticism. I’d used Dove hair products before, so I knew it was going to be nice. I just didn’t know if it was going to work for my hair. 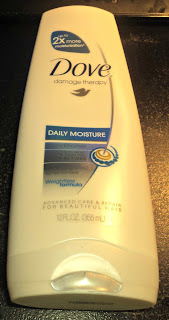 I received Dove Damage Therapy Daily Moisture Conditioner and I was happily surprised at my results. I pretty much like everything about it. First off, I love the bottle. I like it when conditioner bottles have the cap on the bottom. Not only does it make it easy to tell the difference from the matching shampoo bottle, but it also makes it easier to grip and use. Bonus to this Dove bottle as well, because not only is the cap on the bottom, but the bottle is tapered and more of a rounded triangle shape so it fits well in your hand, and you are less likely to drop it while trying to use it with wet hands. Additionally, the conditioner itself is just as nice as its container, too. When you pour it out, you notice that it’s soft with a pearly finish, but it doesn’t feel heavy or thick. It does have a scent to it, but it isn’t overpowering or heavy and I find that it doesn’t follow me for the rest of the day, meaning that my head isn’t surrounded in a cloud of rose petals. When I’m using it as my regular conditioner, I find that I need about a quarter size about to completely condition my shoulder-length hair. It works easily through my hair and after leaving it my hair for 30 seconds to a minute, it makes my hair super soft and easy to work with for the rest of the day. If my hair is especially dry, like after a coloring, I will leave this in longer, say 5 minutes, to help keep my hair from looking like straw. I’ve also been using this on my daughter’s hair, which is much like mine, only she has more of it, and I must say that this has saved us from many a screaming fit in the morning, while I fix her hair in pigtails. I haven’t had to use the detangler since using this conditioner on her hair. I used this conditioner exclusively for about 2 weeks and I really loved it. I’ve even been using a nickel-sized amount along-side a conditioner for color-treated blonde hair. I definitely will be purchasing a second bottle of this when I’ve used this one up. In fact, I've already purchased other items in the Dove Hair Therapy line because I like this conditioner so much. If you are like me and you have fine, thin, color-treated hair, I encourage you to try Dove Daily Moisture, and to assist you in trying this fabulous product, there is a link to a $1.50 off coupon at the bottom of this post. Also, be sure to enter the sweepstakes (information to follow) as you can win a $1000 Spafinder gift certificate. Sponsored post. I was provided a sample for this review. However, opinions expressed within this sponsored post are my own. So good to know that this conditioner worked well. I am also very picky about my conditioners too.